Ahoy there me hearties. Not everyone is lucky enough to have a Gran who is a Pirate,” and while I can’t lay claim to that, I have got a friend who is. You see, I have worked at a Catholic newspaper for over ten years and one of the lovely people who writes features for us is Geraldine Durrant, wordsmith and author extraordinaire who wrote Pirate Gran, Pirate Gran and the Monsters and Pirate Gran goes for Gold. When Boo was born we got a beautiful signed copy of Pirate Gran Goes for Gold and I can wholeheartedly say it is one of the funniest children’s books you will ever read. Now while I would love to write about Geraldine’s books (which, I might add have been translated into Spanish and have been published across the world). However today I have something very exciting to tell you about. 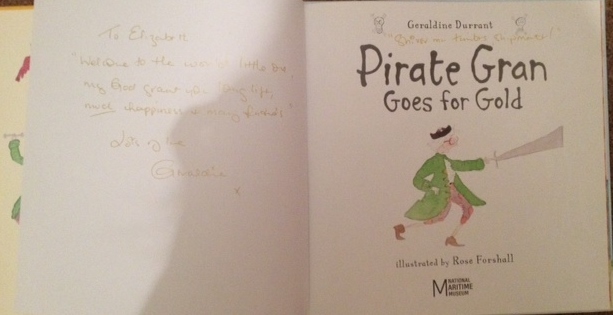 A while back, Geraldine told me her books were being adapted for the stage by Scamp theatre company. 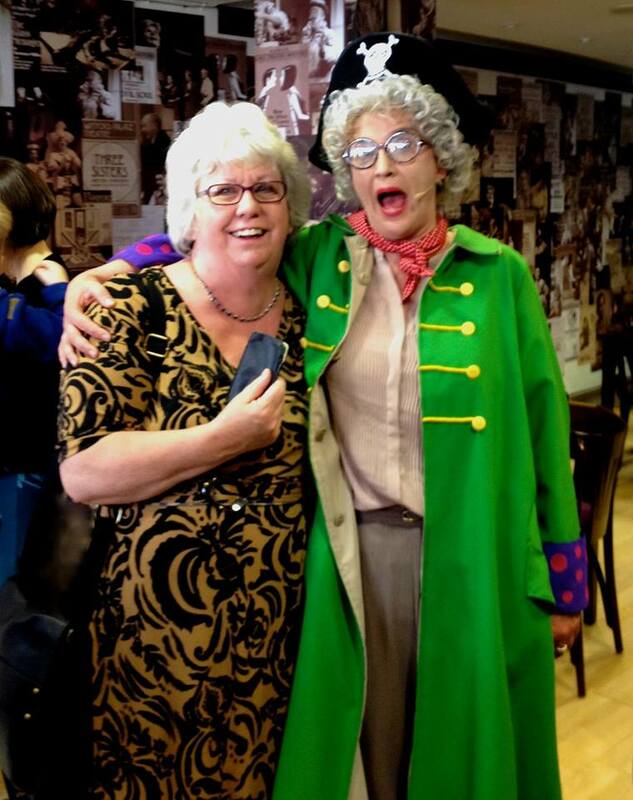 Last weekend saw the opening show in Watford which Geraldine was special guest at. Geraldine met actress Pauline Goldsmith playing the eponymous Pirate Gran – and Gran’s crocodile Nippy who has been made by Toby Olie, one of the puppeteers who designed and operated War Horse. “It was a real once-in-a-lifetime experience,” Geraldine told me. “The show was sold-out and sitting in the dark with a theatre full of small children watching Pirate Gran come to life was magical – as an author you don’t usually see people enjoying your characters. With the critics’ plaudits already ringing in their ears, Gran and her pirate crew are now off on a UK tour which includes a week at the South Bank’s Udderbelly Festival, a month in Edinburgh, and appearances at Eastbourne’s Devonshire theatre in May where Geraldine will be taking all her grandchildren to see the show. I have tickets for when Pirate Gran swashbuckles her way over to the Lowry in Salford so what are you waiting for? To find out when Pirate Gran will be at a theatre near you, click here. This was not a sponsored post. I am just Geraldine’s biggest fan. Gosh! Blush, blush, blush…How lovely is that?